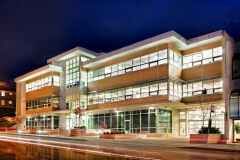 This building received a VIREB Award of Merit for Commercial Building in 2008. Design Build project with LEED Silver rating offers 28,000 sq ft of leased office space designed by Chow Low Hammond Architects Inc. The majority of the office is occupied by provincial government ministries. Concrete construction for the main floor provides for parking and the steel structure creates the two levels above that. The building features a large light well in the middle which brings natural light to the occupants on level 2 and 3. The building also has energy efficient HVAC system with heat recovery tinted low E glazing water efficient plumbing, drought hardy planting and low V.O.C. wall finishes.